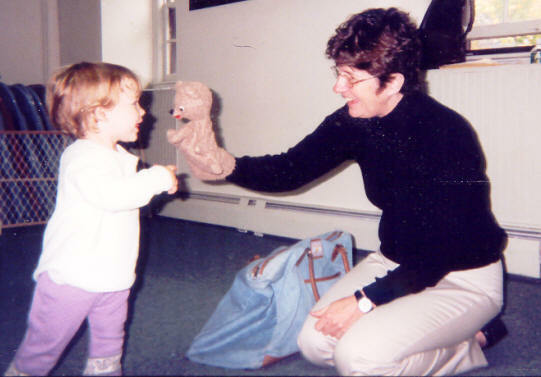 Sharon Carter Grimes and her puppets Mr. Bear and Baby Bear have been delighting young fans now for more than 25 years. Sharon uses her background in elementary education and art to continually update the Babies and Books programs. She shares her experience through workshops for childcare providers, librarians, parents and caregivers. She has presented at Salem State College, the Legacy of Teaching, the Child Care Circuit, Wenham Museum, Connecting Young Moms (Beverly Hospital), Community Partnership Services, and many Northshore area schools and libraries. Sharon is a member of the Canadian Association of Storytelling for Children, and is available for book talks, storytelling and related workshops.